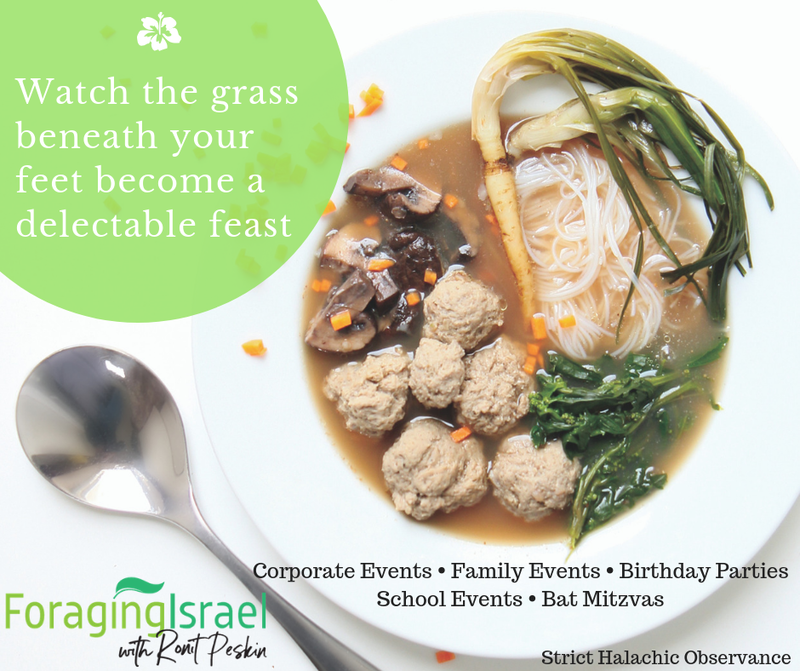 Learn to forage edible wild plants with Ronit Peskin this summer, with many different affordable foraging classes for families around the country! Modiin: Wednesday July 25 at 4:30 pm at Givat Titorah. Netanya: Wednesday August 1 at 4:00 pm. Location TBD. I want to apologize for not updating the class schedule here. 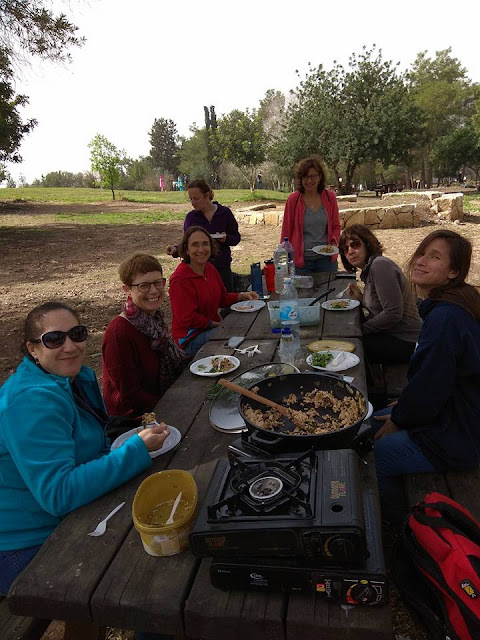 We've had a very packed chol hamoed; I taught a group class in Efrat on Sunday, April 1, starting behind the matnasit and going over the bridge and then into Park Hashibolim. Today, April 2 I taught a private foraging and cooking class for a family get together, where we made cheese and then used it in our kosher lipesach and kitniyot free Indian curry, palak paneer, which we ate over potatoes, and a delicious salad, using a variety of wild veggies, from dock to wood sorrel to garland chrysanthemum to salsify to milk thistle. 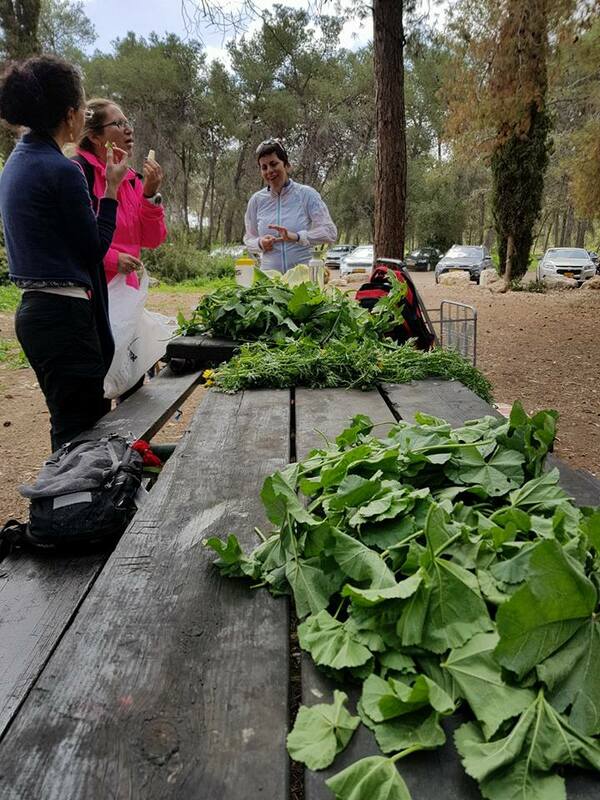 After that, I taught a group foraging class also in the Ramot forest. 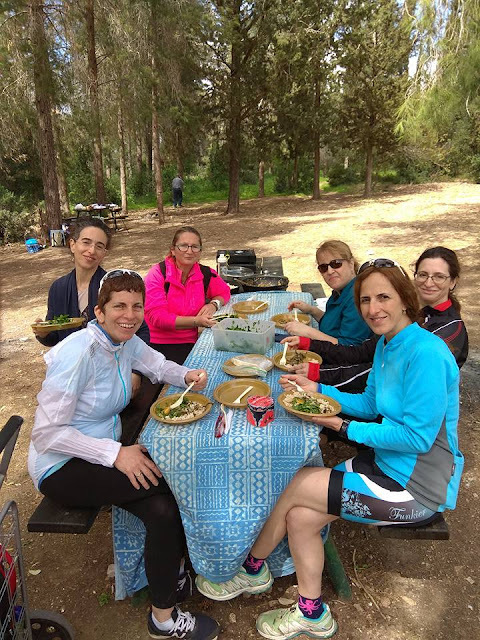 Tomorrow, April 3, I will be teaching a class in Beitar starting near the Iriya, and going down into the Wadi between Giva A and B.
I wanted to share a few reviews that I got recently. I've taken tours from Ronit, she is energetic, knowledgeable, kid-friendly, and FUN. Really enhanced my knowledge and appreciation of the flora (plants) of the Holy Land. 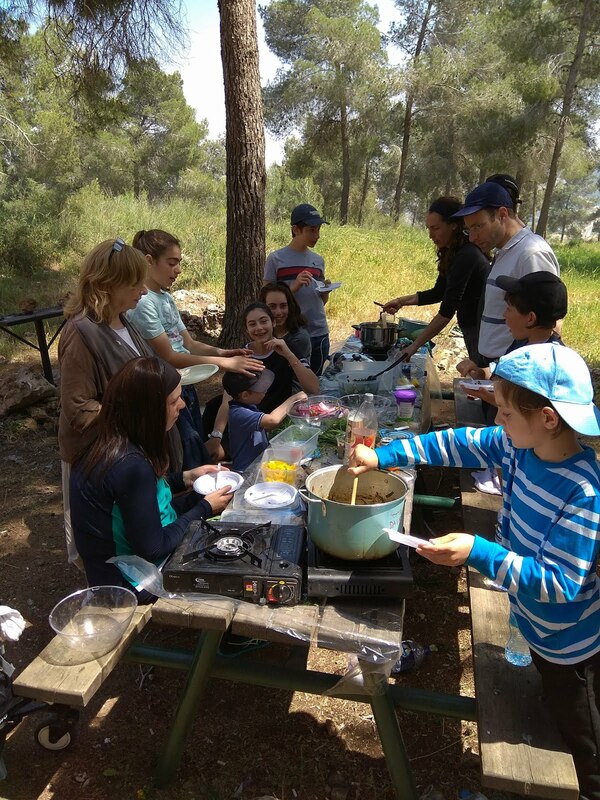 -Rachel H.
We went on a foraging tour of the Ramot forest with Ronit today. We had a great time, learnt so much from the plants around us. My son (aged 8) was particularly inspired by the tour and has started foraging in our garden?! Ronit is a naturally confident tour guide who really knows her foraging stuff inside out, she answered any question thrown at her. You can tell she lives, breathes, eats foraging (literally). It’s a healthy reminder to take a look at what’s around, for free, and help get back to basics. Recommend for children 5 plus, make sure the weather isn’t too hot as the forest is less dense than you might imagine. Recommend going in smaller groups- 3 to 4 families but Ronit is flexible with helping get groups together. Really recommend and we plan on doing the cooking foraging class in the future. Thanks so much for a great, inspiring afternoon. -Rachel C.
My 6-year-old son and I went on Ronit's foraging tour today, and we both had a great time. I highly recommend it to anyone who loves the land of Israel and wants to know what it produces, or who is looking for a fun family activity, even if they don't plan to start foraging in practice (and all the more so if they do). Ronit provided an impressive amount of information in a clear and interesting manner. If participating with small children, bring snacks in addition to water and hats: the tour, while not physically demanding, is quite long (2 hours). -Raanan E.
מדהים ונעים להכיר את צמחי מאכל שיש לנו בטבע, ממש בכל פינה. My friends and I enjoyed a great morning out with Ronit! She taught us so much about foraging and the meal we made afterwards was very very tasty! Highly recommended! And here are a few more classes from some recent private foraging and cooking classes in the Ben Shemen forest. If you'd like to inquire about booking a private foraging or foraging and cooking class, email rmpeskin@gmail.com or call 050-710-1791. Classes are available both in Hebrew and in English. Some people dislike the cold and rain. Me? I love it. New wild edible plants starting to pop up everywhere! Come join on a fun foraging walk/hike in the Lifta in Jerusalem on Thursday November 16 at 10 am. Conveniently located right near the String Bridge/The Tachana Merkazit, the Lifta is the home of an abandoned Arab village with a spring and beautiful scenery and lots of wild edible plants. We'll find and learn about a multitude of edible wild plants, learn how to use them in the kitchen and as medicine, while having a great workout. This class is a little bit more strenuous than most- please wear hiking friendly shoes and clothing, and strollers are not able to be used on this hike. We meet at the entrance of the Paz gas station between the string bridge and knisa la'ir. Cost: 50 shekel, 45 shekel if you bring a friend, and 40 if you've attended a previous foraging class. Foraging for food is wonderful, but did you know that you can also make homemade hypo-allergenic and healing soaps using foraged ingredients? Join this class to learn how. Do you regularly buy all natural soaps from the health food store, and looking for a cheaper alternative? Do you have sensitive skin, or any skin ailments such as eczema, psoriasis, etc...? Do you like learning traditional skills that have mostly been forgotten these days? Or do you just like learning fun, new crafts? Whatever the reason, come join Ronit Peskin of PennilessParenting.com and SabRonit Soaps for a fun and educational artisinal soap making workshop this Monday, February 6, 2017, where we'll learn how to combine easily obtainable all natural ingredients to make hypoallergenic healing soaps easily at home. We will be making both plain soaps, and soaps with additional extra healing additives such as foraged cactus paddles and plantain, Dead Sea mud, turmeric, lavender, or activated charcoal, to target specific skin issues. You'll leave the class with this very useful (and money saving) knowledge, as well as two ready to use bars of soap. Now for a limited time only at an introductory price of 100 shekel, 75 shekel if you bring a friend. Because of safety concerns, this class is only open to adults. Unfortunately, that means babies or toddlers in strollers or baby carriers are not able to come. Location: 38 Tchernichovsky, Apt 10, top floor. Bumental on the door. Rasco. Space is limited. To reserve your spot, or for more information, 050-710-1791 or rmpeskin@gmail.com.